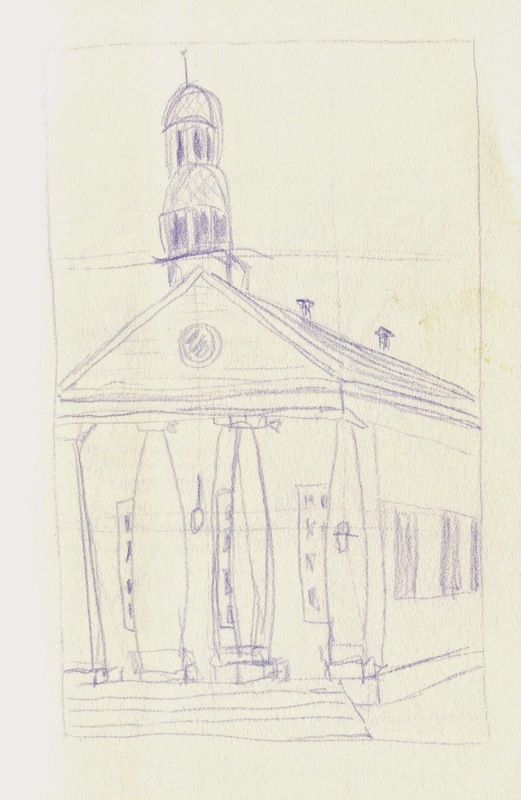 Thanks to the wonderful lessons in Liz Steel's Sketching Now Foundations class (you can find more out here), I drove into town this week to do a few rough scribbles using a viewfinder to help with composition, framing, and accuracy of the sketch. I confess that I'm more of a loosey-goosey sort of sketcher, more interesting in trying to capture what I see than in measuring and accuracy. However, I know the value of being pushed to try new ways of doing things. And I discovered during my adventure that looking at something in a new way (through a viewfinder) helped me see things I had not seen before--and in a landscape I look at every single day when I go to work! Anything that helps me see newness in what might otherwise seem a dull never-new setting is good. So I recommend this exercise with a viewfinder if for no other reason that that: you'll see things you did not see before! It's easy enough to make your own viewfinder: there is a nice video here for one sort and good instructions here for another. You can find lots more on the internet if you want. The point of a viewfinder is this: it gives you a small window to look through at the world in front of you. This helps you focus on the way you might want to compose your drawing. It eliminates some distractions. And it helps you consider composition through "the rule of thirds" which you can learn more about here. This is a composition theory many of us have heard about in photography, but it applies to sketching too! Anyhow, here are four scribbly sketches I did this morning. The first two are of one subject, a church I drive by every day. First I did a horizontal scribble of the top have of the building. You can see the lines I drew in roughly dividing the picture space into thirds in each direction. I have lined up the church's tower on a one third vertical line and placed the connection point between the tower and the roof at the one third horizontal/vertical junction. I left a lot of empty space in the upper left because that is where I intended to add writing later. 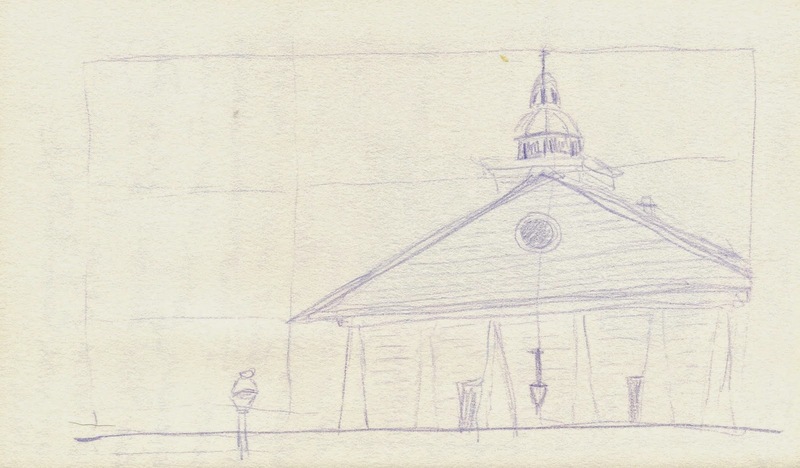 This next sketch is of the same subject with the frame turned vertically. This time I aligned the tower on the left third of the sketch. You can see things got wonky on me. I was sketching in my car, holding my viewfinder in my left hand and trying to balance the sketchbook on my steering wheel while drawing! Not an ideal situation. Still, I found that the viewfinder did help me "see" angles more accurately than I might have otherwise. After two drawings of the church, I drove around the block to a spot where I could parallel park and look down a fairly empty street. One of Liz's assignments is to use the viewfinder to draw a street scene and check for accurate placement of items in the scene. First, I tried to capture a few buildings along one side of the street. While this doesn't look like much, it actually helped me see many things I would not have perceived otherwise. The very weird angle of the complex rooftops (even though I didn't get the windows right at all, the roofs are pretty solid). The size of the "no parking" sign relative to the buildings from my viewpoint! Liz asked us to capture mostly shapes or edges and I did a little more than that--and that's where things went awry for me!! So I look forward to getting back out there and trying this again--which just shapes or outlines. 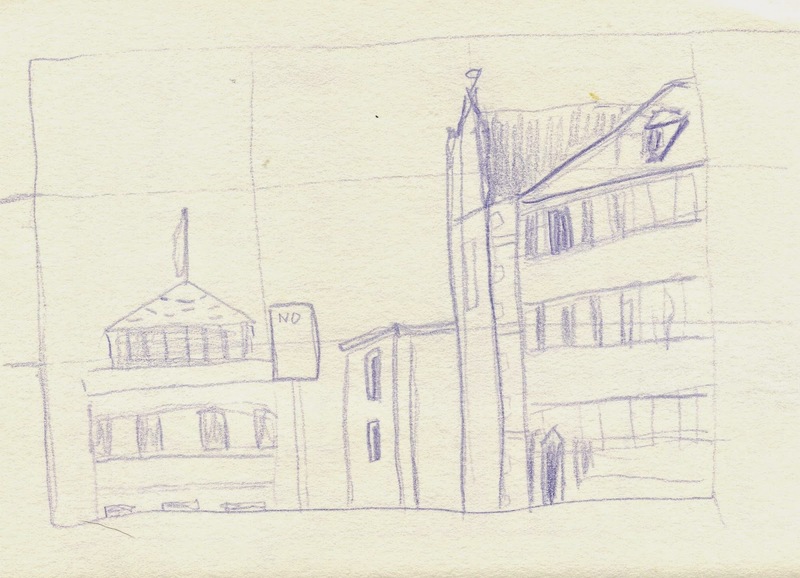 Finally, my fourth and final scribble is looking down the center of a street, capturing the building at the end of the road and those along the left side. Here I stayed more true to the instructions to just capture basic shapes. What I saw--really saw, even though intellectually I might have known it: the closer car is much bigger than the ones further away. I actually started by drawing "car" rather than drawing what I actually saw and drew them all the same size! It wasn't until I rechecked the viewfinder that I realized I was drawing from my brain ideas instead of from what I actually saw. 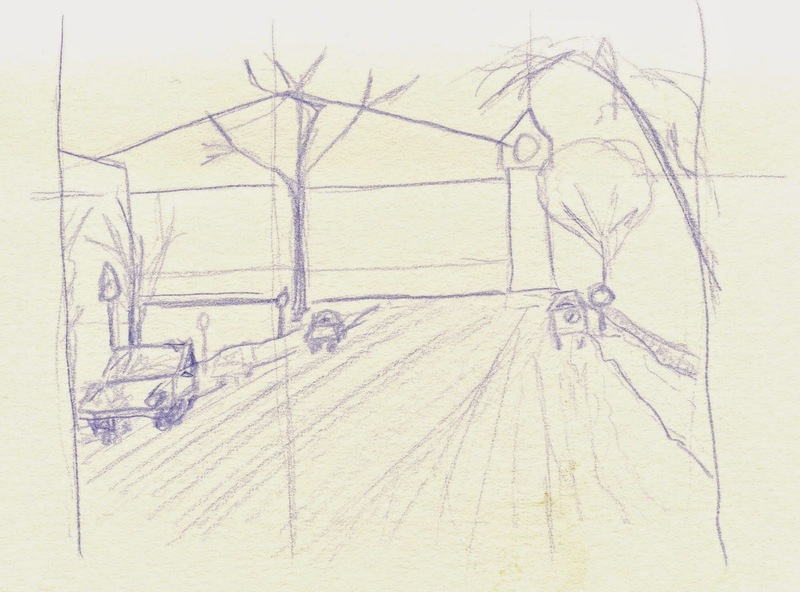 I'd be interested in adding paint to this sketch to see if I could capture the bleak gray cold winder weather and the emptiness of this street on a sleepy Sunday morning. But that's for another day. I can't say that sketching with a viewfinder is my favorite thing. It's a lot to hold onto all at once. It makes looking up and down from paper to subject a bit harder. But I can see the value, especially as I learn to draw larger landscape sorts of subjects. I am going to keep at it.